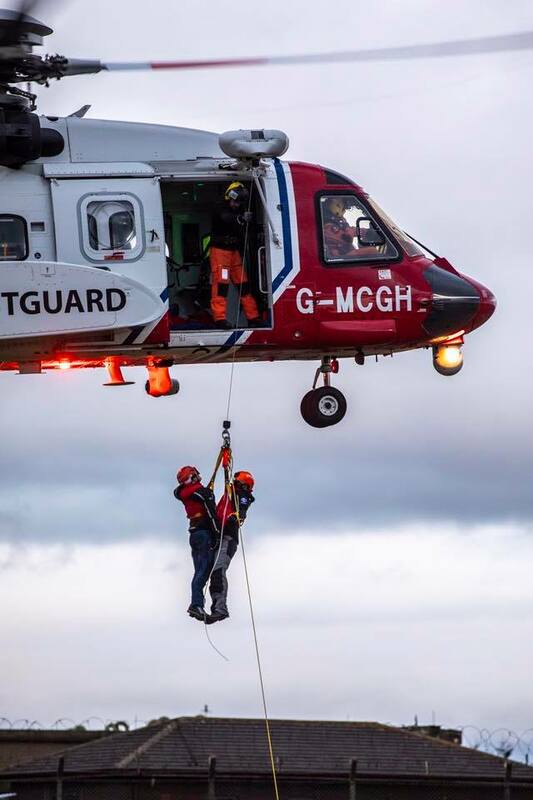 SAC Blake Carruthers captured superb images of the Mountain Rescue Team training with the Humberside Search and Rescue crew. 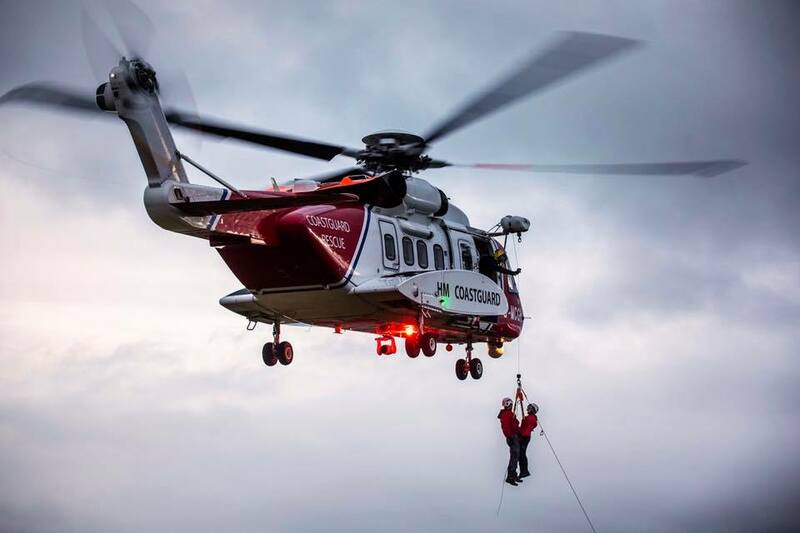 The annual event included winching to and from the aircraft and training on the high line – used to stabilise a stretcher as it’s winched up through the helicopter downdraught. Huge thanks to Scarborough and Ryedale MRT, Cleveland MRT, Swaledale MRT and the Maritime and Coastguard Agency for helping to create such a fantastic opportunity. 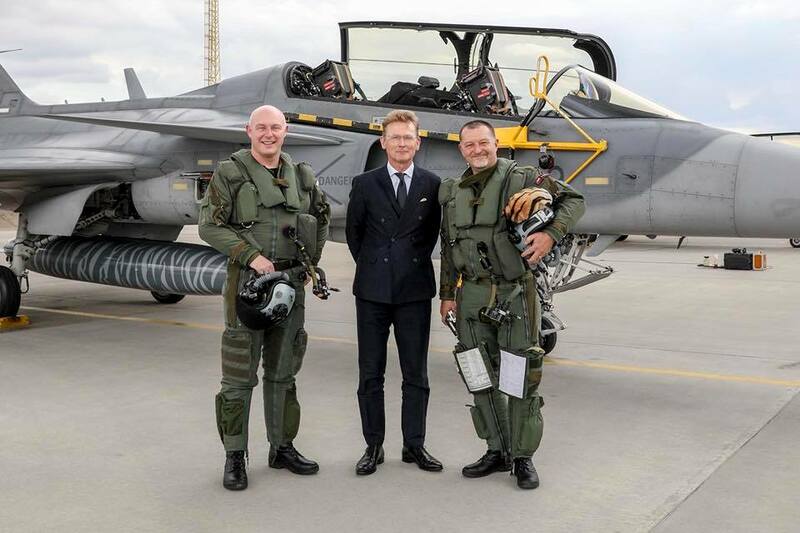 100 Sqn personnel taking part in Exercise Central Hawk were visited at Čáslav Air Base by the British Ambassador to the Czech Republic, Nick Archer MVO, and Air Officer Commanding of Number 1 Group, Air Vice-Marshal Harvey Smyth OBE DFC MA RAF. AVM Smyth experienced the full capability of a Czech Republic JAS-39 Gripen jet during an air combat session with a 100 Sqn Hawk. Back on terra firma, Mr Archer was invited to try out the 211 Sqn simulator before viewing both Gripen and Hawk jets close up. Photos by SAC Hazel Reader. 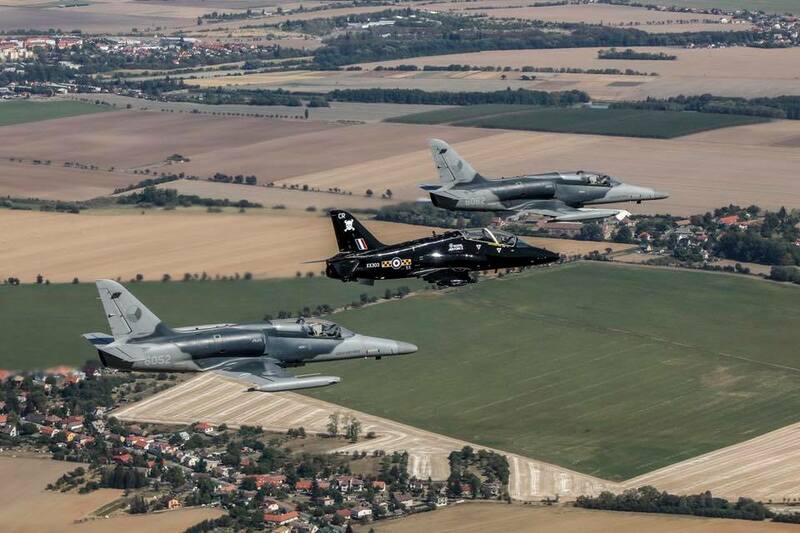 SAC Hazel Reader has captured this image of a 100 Sqn Hawk in formation with two Czech Republic's ALCA L-159's (Advanced Light Combat Aircraft) from Čáslav Air Base. 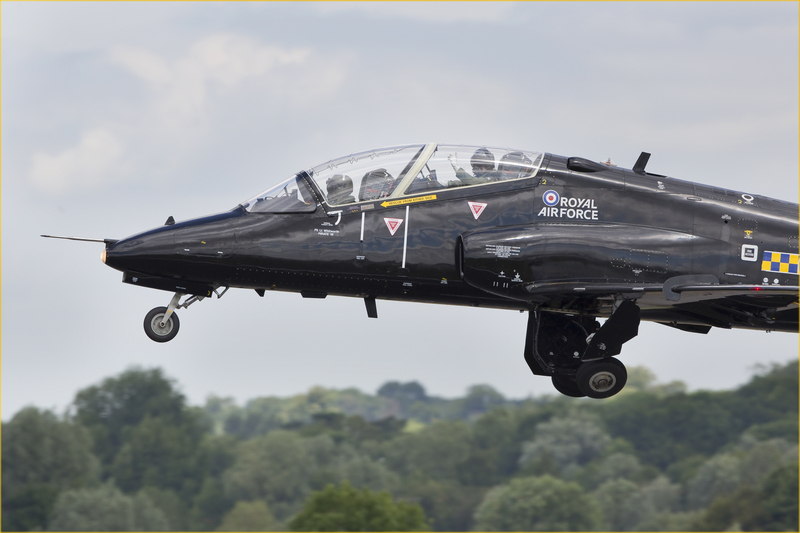 Members of the Czech Air Force have experienced the capabilities of the Hawk T1a - which will be used to assist with dissimilar air combat training for the duration of the Exercise. Such training is vital in enabling pilots to prepare for any situation or aircraft they may face on future operations. 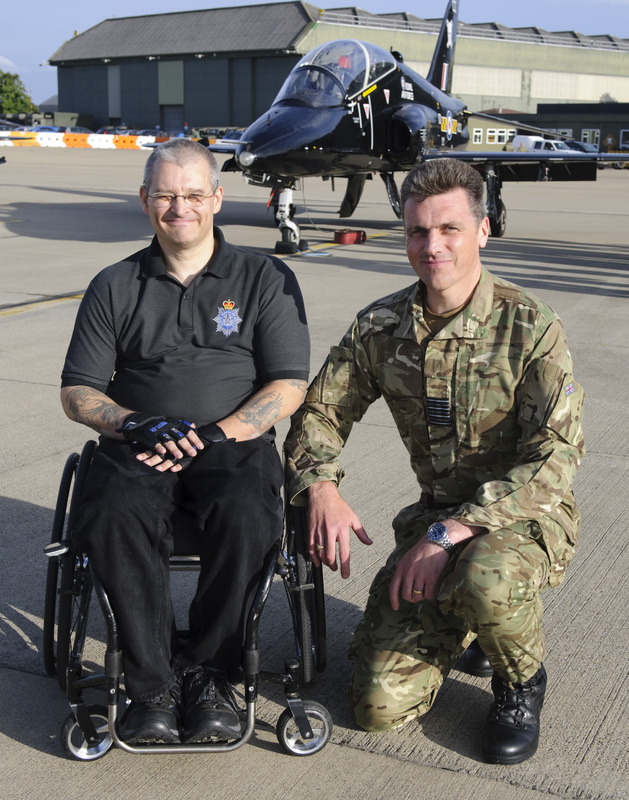 Sean Allerton, 48, was left a tetraplegic when he broke his neck in a motorcycle accident, which happened when he was serving with the 34 Squadron RAF Regiment (currently based at RAF Leeming), in Cyprus almost twenty-one years ago. Despite the tragic consequences of the accident, Sean has been able to build a new life in his own home thanks to his personal determination and the support of various charities such as the RAF Benevolent Fund and the Royal Air Forces Association. He is a keen fencer, is currently studying for an Open University degree and, in 2011, learned to fly thanks to a Flying Scholarships for Disabled People scholarship. Sean wanted to give a little back by raising awareness and to raise money for the charities that have aided him over the past 21 years to rebuild his life, specifically The Royal Air Force Association, The Royal Air Force Charitable Trust, The Royal Air Force Benevolent Fund and The Flying Scholarships for Disabled People. Inspired by The Proclaimers song ‘500 miles’ Sean initially decided to push 500 miles unaided in one of his everyday wheelchairs - a task he achieved in sessions at various RAF bases across the UK in ten months. Spurred on by his success, Sean pushed ‘500 more’ in just five months. Not content to leave it there, Sean immediately embarked on yet another challenge – this time aiming to top 1,000 miles. He said: "At one point I managed to do 112 miles over 4 nights at RAF Church Fenton. It’s all about setting the rhythm and you just keep going. I don't get bored because I usually see lots of wildlife." "There are 8,000 miles in The Proclaimers' song and while I can’t promise to do all 8,000, I will keep going while the charities need money and I have got my health. The charities have been life changing – help from them has really facilitated my life." Sean has been undertaking a number of pushes at differing airfields across the country. On August 28th 2013 Sean visited RAF Leeming, this date and the location has special significance for Sean as 29 years earlier on this day in 1984 Sean signed up to the RAF Regiment. Sean served with 58 Sqn RAF Regiment, 3 Sqn RAF Regiment back to 58 Sqn RAF Regiment for a second tour, and finally with 34 Squadron RAF Regiment - currently based at RAF Leeming. There was no debate as to where Sean wanted to complete his second 500mile push and commence his next challenge of a 1000mile push. November 2013 saw a return visit by Sean to RAF Leeming. This time as a recce as he had planned to undertake a 24hr push around the base later in the year. During Sean’s recce, he was joined for stretches of his journey by personnel from across Station, including members of his old Squadron – 34 Squadron RAF Regiment, 609(WR) Auxiliary Squadron, RAF Leeming Station Commander, Group Captain Steve Reeves, and 100 Sqn Commanding Officer, Wing Commander Tony Cann, who got to know Sean through his assessor role with Flying Scholarships for Disabled People. Some of the guys even covered the ground using Sean’s spare wheelchair, so that they could really understand his experience. Sqn Ldr Jeff Metcalfe, Officer Commanding 609(WR) Aux Sqn said: "It was fantastic to get Sean here to cover a few miles. I pushed alongside him for a while and just couldn’t keep up! It was incredibly difficult to even stay in a straight line. Some of the ground may look flat when you walk, but isn’t when you’re trying to push a wheelchair!" 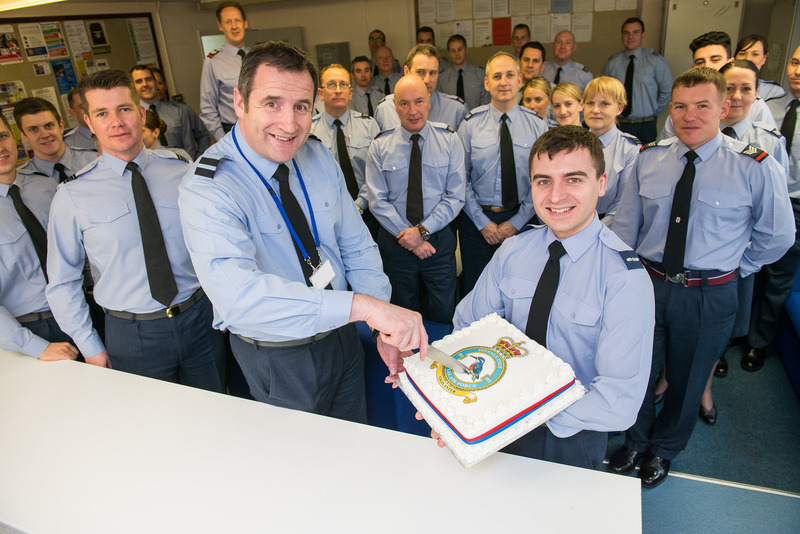 With months of further planning RAF Leeming welcomed Sean back most recently on 16th June 2014. This time Sean was looking to complete a ‘Push 500 Charity Endurance Challenge’ in the form of a 24-hour push, starting and finishing at the RAF Leeming Primary School. Children from the school waved and cheered as Sean and the rest of the team set off and also when they returned. 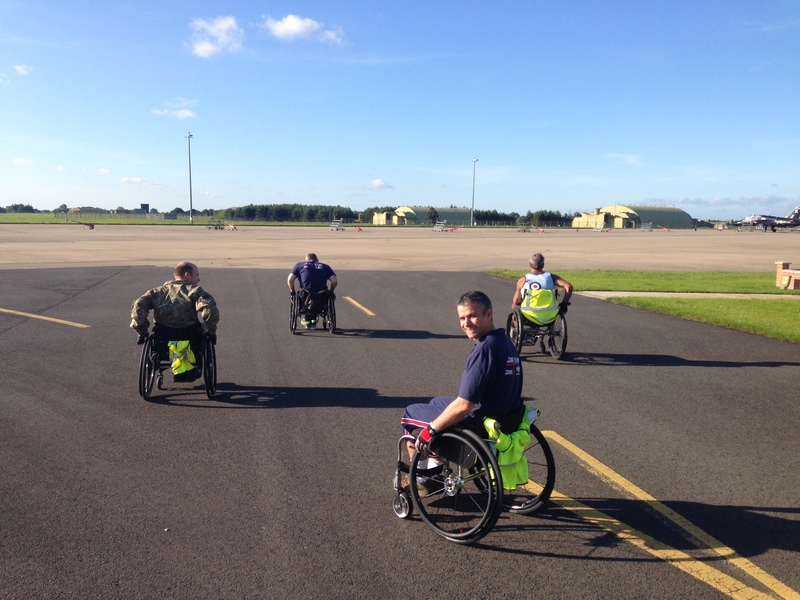 Wing Commander Tony Cann and Flight Sergeant Dean Bradley along with several other personnel from across the Station joined Sean in spare wheelchairs with the intention of covering as many miles as they could. 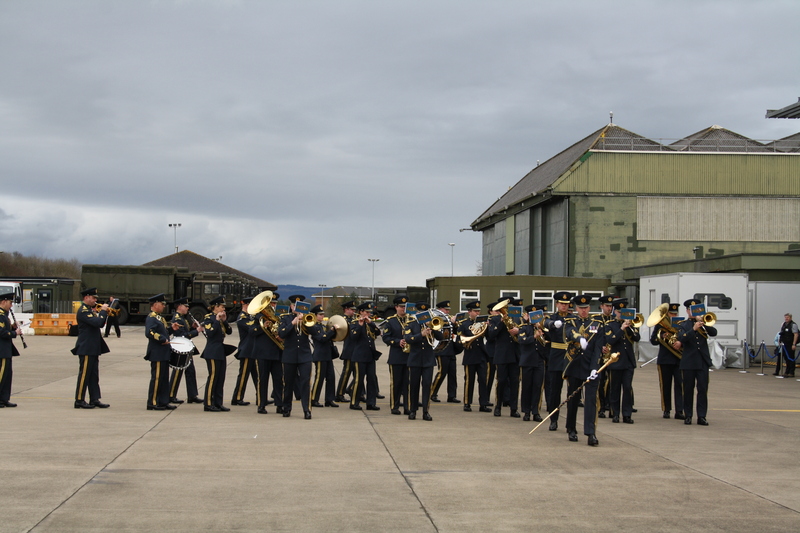 Wg Cdr Tony Cann Officer Commanding 100 Sqn said: “It was a privilege to join Sean. The man is a machine. I only managed 20 miles, and seeing the children cheering us to the finish line this morning made me feel pretty emotional”. 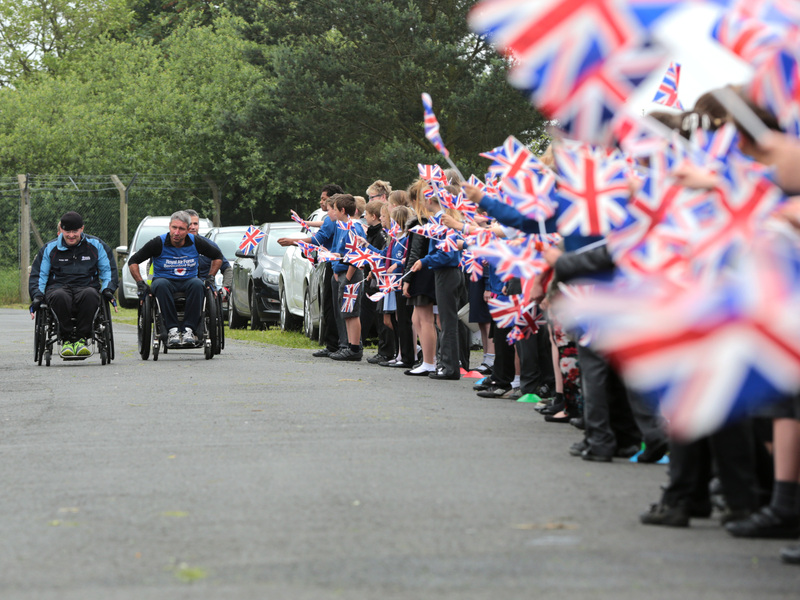 Sean and RAF personnel on their final stretch at RAF Leeming being cheered by pupils from RAF Leeming Primary School. Sean Allerton and Wg Cdr Tony Cann Officer Commanding 100 Sqn flanked by other RAF Leeming personnel in front of 100 Sqn Hawks. Sean Allerton with RAF Leeming Station Commander, Group Captain Steve Reeves on August 28th 2013 at RAF Leeming. Sean Allerton, Wg Cdr Tony Cann, Flt Lt Tim Clement and Flight Sergeant Dean Bradley set off for the evening stint of the 24-hour push. Saturday 12th July saw Sean Allerton, Wg Cdr Tony Cann accompanied by Flying Officer Liam Green spending over an hour signing the limited edition prints and chatting to many of the enthusiasts within FRIAT and a lucky few got a personalized tour of the 100 Sqn Hawk on static display. The sales produced a £310 donation to Push500. In addition, the FRIAT members were given an exclusive and impromptu flying display by Wg Cdr Tony Cann; himself an ex-display pilot from 2002, he was able to perform a number of ‘dirty passes’ for the crowd in a privately owned, customized jet supporting the colour scheme of the Red Arrows – the display received a rapturous applause from the FRIAT grandstand and, ironically and rather embarrassingly for Wg Cdr Tony Cann, from the REDS themselves in the adjoining enclosure. 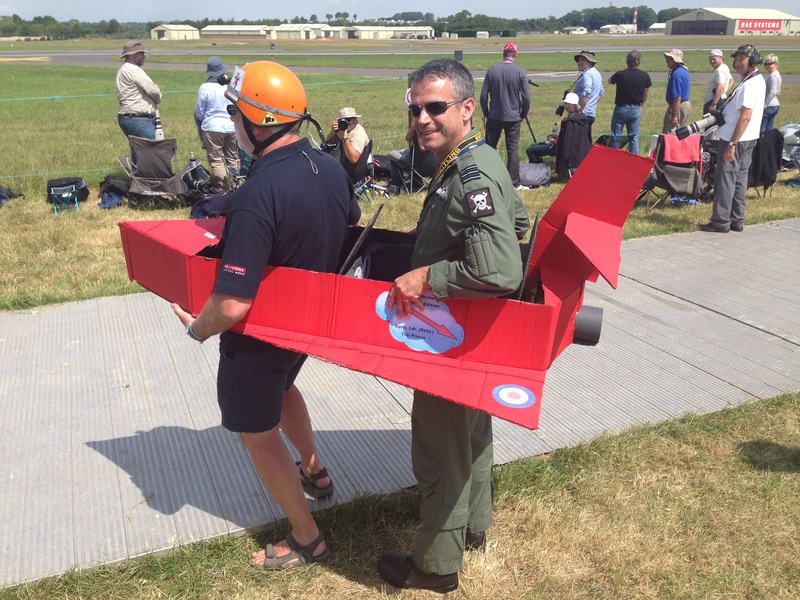 Wg Cdr Tony Cann carrying out a number of ‘dirty’ flybys within the FRIAT enclosure at RIAT 2014. Sean’s 1000 mile challenge continues, most recently he completed another 24 hour endurance challenge at RAF Cranwell on 26th July 2014,completing 48.12miles in blistering heat, bringing the total miles completed of Push 1000 to 374.89 miles. Plans are being prepared for another 24-hour push this time at RAF Linton in August. FLAG member Peter Dixon met with both Sean and Wg Cdr Tony Cann whilst undertaking the 24-hour push on the 16th June 2014. Although Peter was unable to participate in the push that day, Peter was very inspired by Sean’s cause. A number of limited edition 100 Sqn prints were presented to Peter and he was tasked to raise money for Sean’s cause from the sale of the prints. Peter, an avid aviation enthusiast, got in contact with FRIAT (Friends of the Royal International Air Tattoo) knowing that Wg Cdr Tony Cann was bringing a 100 Sqn hawk for static display to RIAT and that Sean would be attending The Flying Scholarships for Disabled People enclosure; he thought it was a great opportunity to invite them both to the FRIAT enclosure during the weekend of RIAT 2014 to meet many of the FRIAT members. 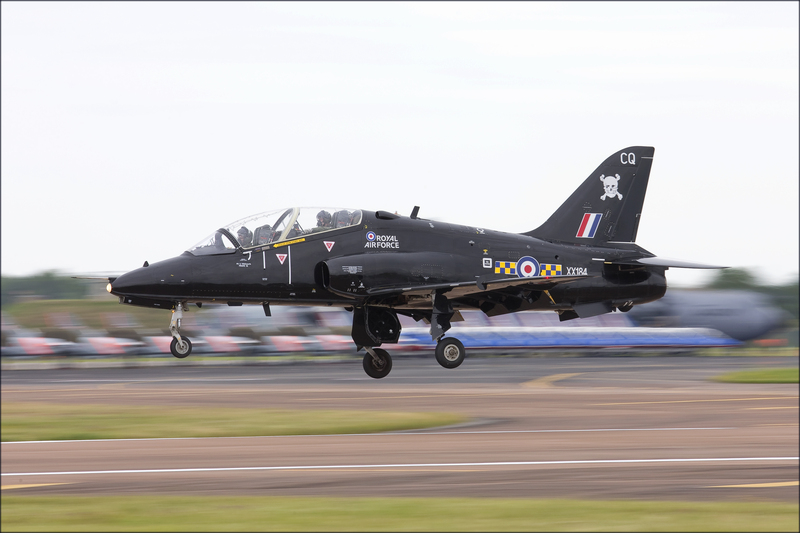 100 Sqn Hawk XX184 landing at RIAT on Friday 11 July 2014. A team of personnel from Leeming battled against the elements to complete the Lake District Total Warrior challenge to help raise money for a local hospice. The team of eight from RAF Leeming took part in the gruelling obstacle race raising over £500 for local baby hospice, Zoë’s Place. As a team they managed to complete the challenge with an impressive time of two hours and five minutes, coming third out of 111 teams. The Total Warrior challenge is a test of strength, stamina, mental determination and teamwork! Participant’s battled their way round the 10 mile course facing more than 35 punishing obstacles including the human BBQ, peaks of pain, hang tough and the ball breaker, not to mention the Great British weather! Zoë’s Place Baby Hospice in Normanby, Middlesbrough provides palliative, respite and end-of-life care to babies and infants aged from birth to five years old suffering from life-limiting or life-threatening conditions. Although they receive a modest amount of Government funding they still rely heavily on the generosity of the public to help raise the £1.2 million a year that is required to keep the doors open for the many families that need their expert care. The participants were Cpl Jim Jordan. Cpl Daz Wass, Cpl Steve Fraser, Cpl Si Willington, Cpl Nick Munro, SAC Ross Hood, SAC Nick Corker and SAC Baz Midgly. Photo - Some of the team following the gruelling 10 mile challenge - Cpl Jim Jordan, Cpl Daz Wass, Cpl Nick Munro, SAC Ross Hood and SAC Nick Corker. 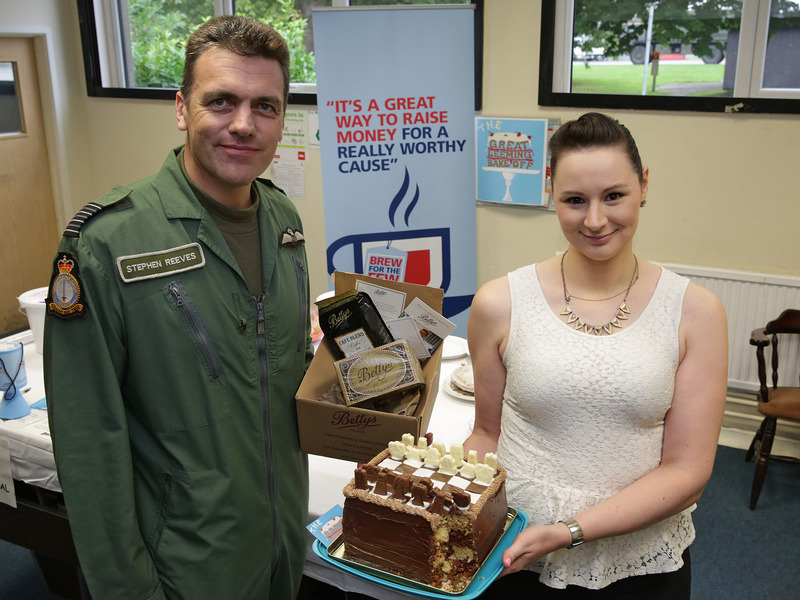 Delicious cakes were entered and judged ‘Bake Off’ style at RAF Leeming to raise money for the RAF Association’s Wings Week appeal. Bakers from across the Station were invited to enter cakes in to the professional or novice categories. A judging panel lead by Station Commander, Group Captain Steve Reeves, enjoyed sampling all of the cakes. Unanimously they agreed to award Royal Air Force Chef Donna Cairns winner in the professional category and Debbie Archer winner in the novice category. Both entrants made chocolate cakes intricately decorated. Debbie’s chess board design had taken her a number of hours to make. Debbie said: “It is lovely to win. I really enjoy baking, I have won other competitions in the past and enjoy entering for fun.” Debbie’s prize was a hamper donated by Betty’s Café and Tea Room. The RAF Association’s well known fundraising campaign Wings Week coincides with the anniversary of the Battle of Britain. Money raised by volunteers and serving RAF personnel allows the RAF Association to support members of the RAF family. 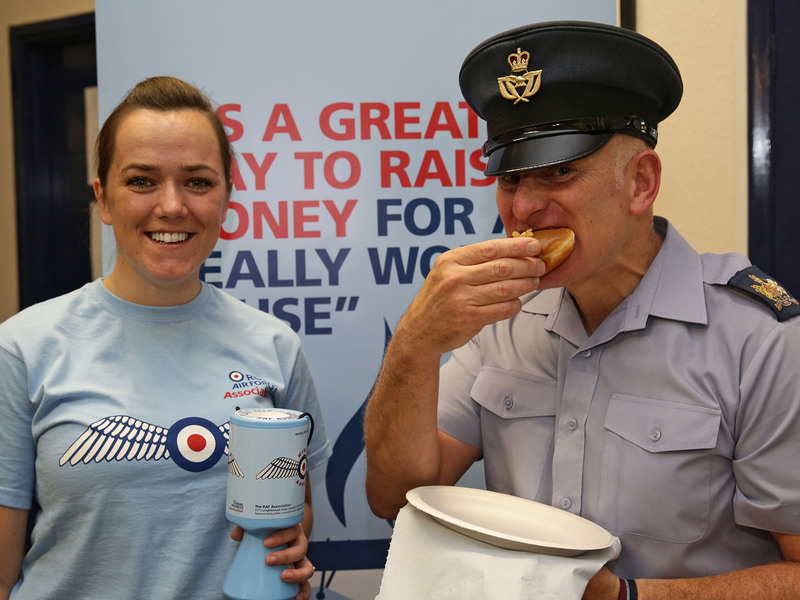 Corporal Jennifer Elliot organised the ‘Bake Off’ and an early morning doughnut sale during Wings Week to raise £257.53. “The money raised will be used for welfare and support. It will also help to maintain the Contact Houses on Station which can be used by personnel and families in times of need,” she said. 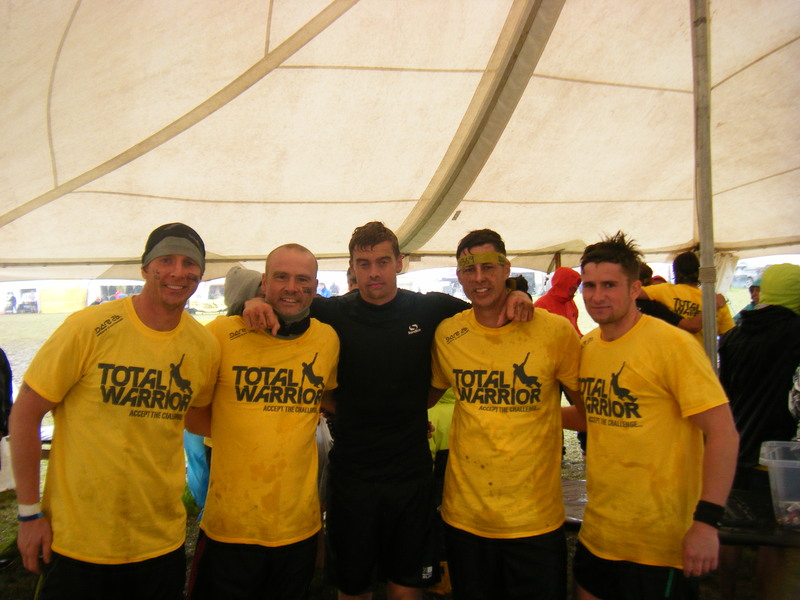 Leeming team participate in Total Warrior Challenge raising money for a hospice. Personnel from RAF Leeming endured heat, cold, blisters and aching backs to race the length of Hadrian’s Wall in just four days. Exercise Centurion Shadow has become an annual competition for members of 90 Signals Unit. Setting off first thing in the morning for four days, teams of six laden with backpacks ran, jogged or walked up to 24 miles each day to cover the route from Wallsend to Bowness. 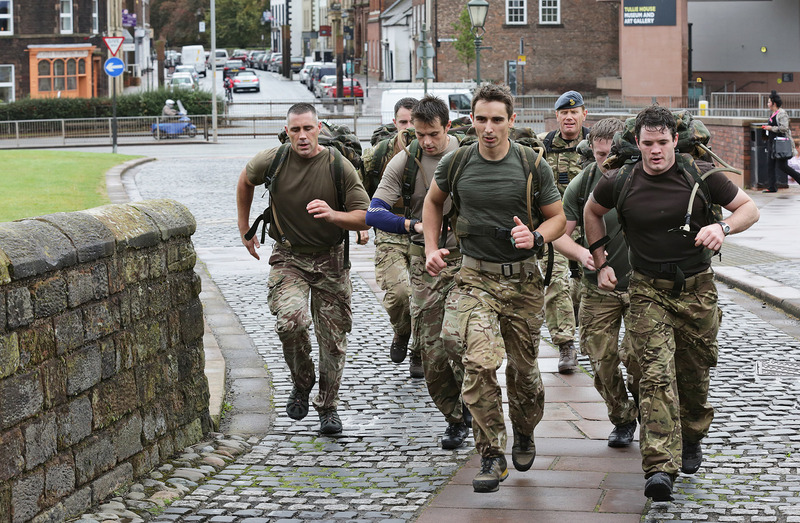 A team from 34 Squadron RAF Regiment also joined the race which is aimed at boosting fitness as well as core team building skills. 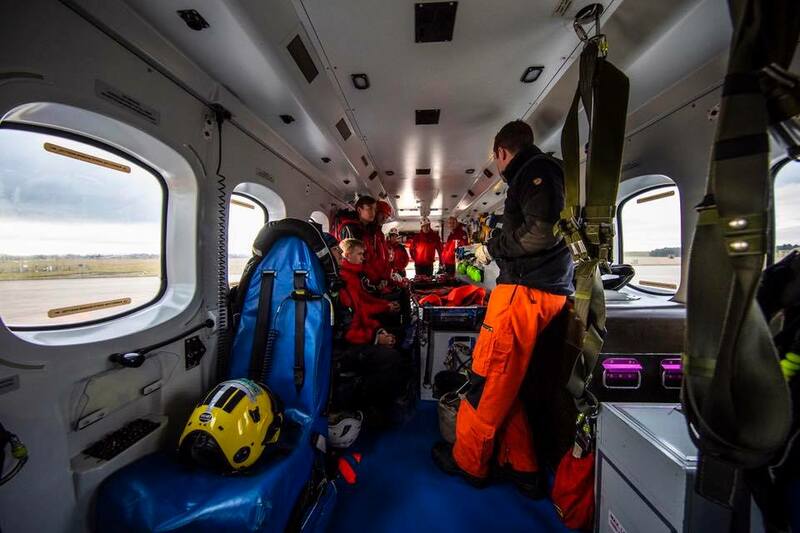 During training and en route, the team also raised approximately £20,000 which will be divided between Butterwick House Children’s Hospice at Bishop Auckland, and The Royal Air Forces Association. Members of the 90 S.U. team including the C.O. Group Captain David Rowland (beret) pound the cobbles during exercise Centurion Shadow. 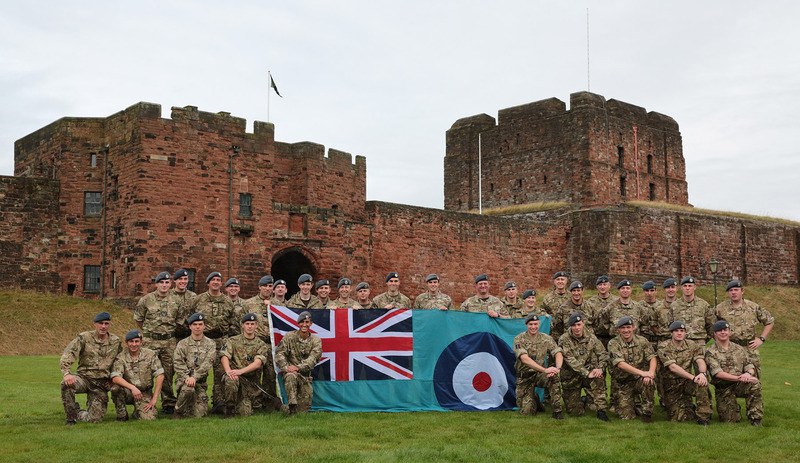 A group photo including 34 Sqn outside Carlisle Castle. 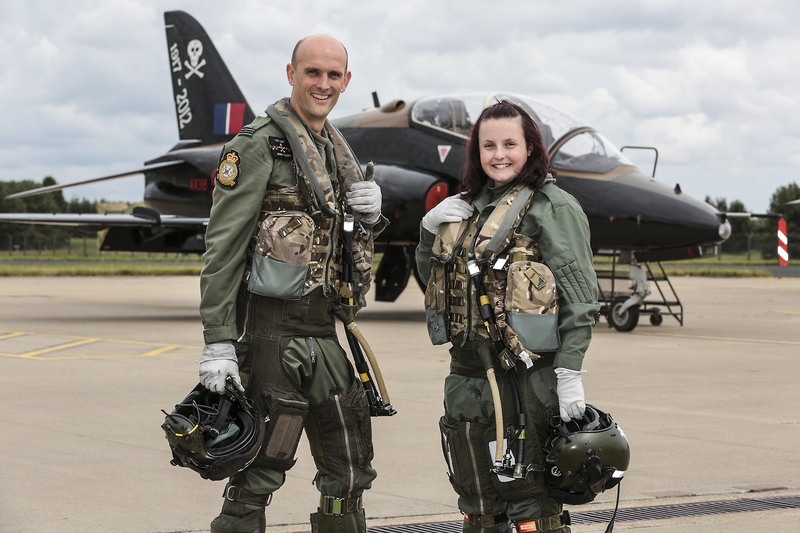 Cadet Sergeant Anna Culshaw took to the skies at RAF Leeming in a Hawk Jet with 100 Sqn in recognition of winning the Northern Region Royal Air Forces Association (RAFA) 2014 Young Person of the Year. Anna from the 1918 (Ruthin) Squadron, Air Training Corps based in North Wales was nominated for the award by her Squadron Commander and was shocked to be picked as the winner. Anna overcame a rare cancer in childhood and spent a year in isolation recovering. At the age of 12 she joined the Air Cadets which gave her the chance to be with other youngsters which is something she missed whilst recuperating. Anna is considered a true role model for others for her positive determination to get on with life in a happy and enthusiastic way. She has supported many other children over the years by sending gifts and letters. Her commitment to Squadron duties and support for others is why she was chosen to receive such a prestigious award. The course is instructed by a team of Regular RAF ICT Technicians and contractors from Babcock, a truly ‘Whole Force’ effort. 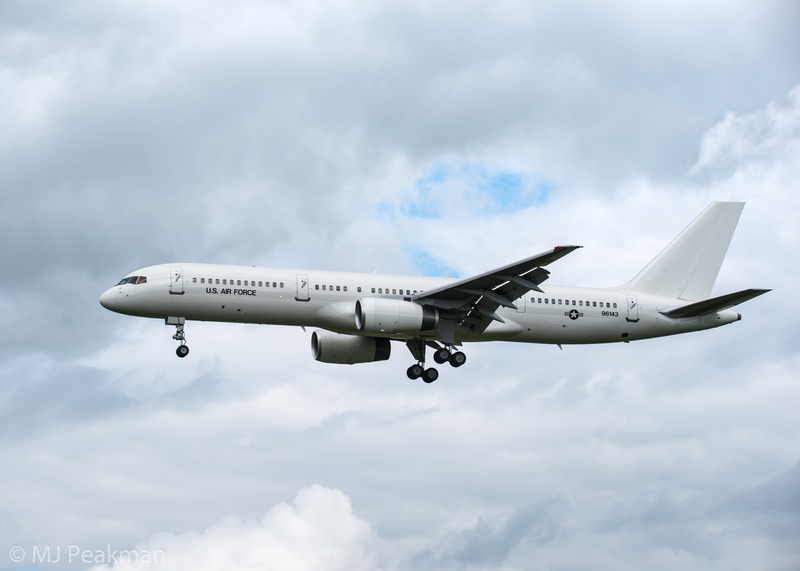 The FALCON equipment, brought into service by BAE Systems, is essential in providing secure communication links for all UK operations across the globe. The Reservists that attended are from varied backgrounds (from Students to Quantity Surveyors) and have differing levels of experience. They engaged well with instructors and expanded their knowledge and capability as a result. Warrant Officer Inglis (44), Operations Supervisor, 32 Signals Regiment commented, “We will continue to work closely with 90 Signals Unit, Babcock and BAE Systems to ensure our ability to support regular counterparts on current in-service equipments whether it is on exercise or deployed operations”. 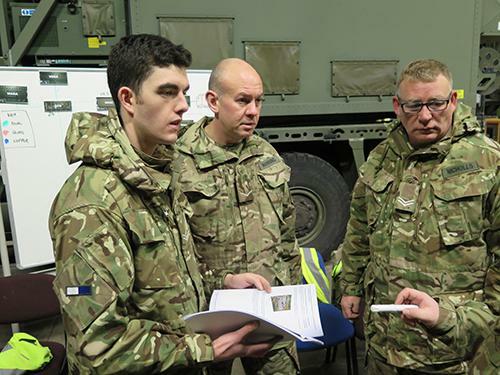 After the success of the initial courses 90 Signals Unit, BAE Systems and Babcock aim to continue their good relationship and deliver training to Army Reserves well into the future. Reservists being taught in custom built FALCON training facility, 90 Signals Unit, RAF Leeming. 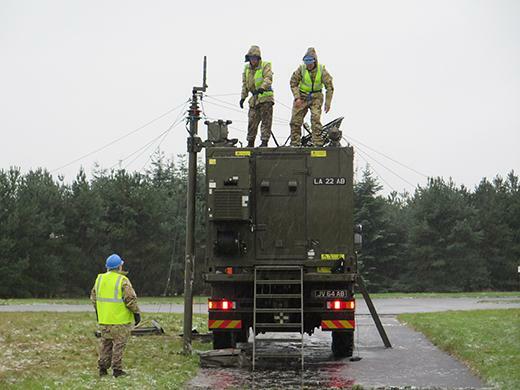 Reservists being taught to erect the FALCON mast and aerial in winter conditions at 90 Signals Unit, RAF Leeming. No. 591 Signals Unit, which has responsibility for defensive cyber operations, has started its 61st year by moving to 90 S.U. at Leeming. With its motto "Vigilanter" the modern role of 591 is more relevant in today's IT environment of cyber threats than at any time in its long operational history. O.C. of No 591 S.U., Sqn Ldr Jim Doyle emphasised the challenges facing of the unit in countering the growing cyber threats to the military. Recently having celebrated its Diamond Anniversary, the unit stands as the independant unit with the longest period of uninterupted service in the RAF. 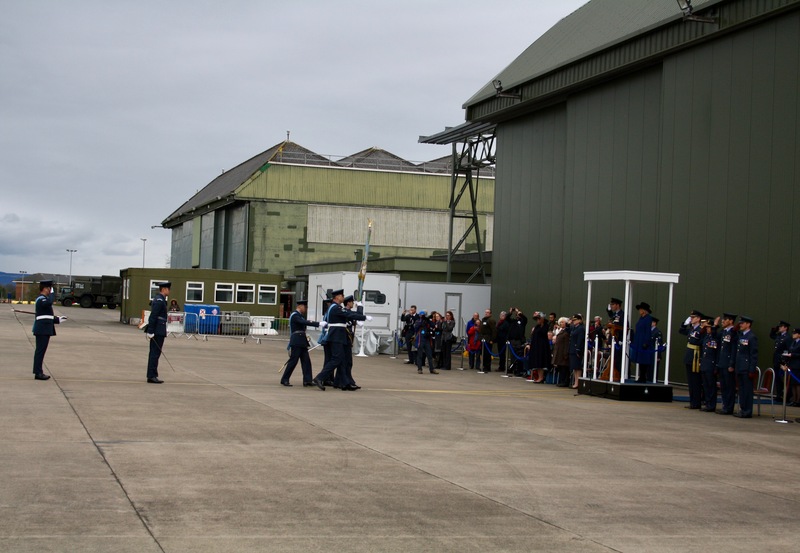 The change of command ceremony at RAF Digby was attended by Air Commodore Alastair Seymour, Commandant of the Air Warfare Centre and Air Commodore Chris Moore, the A6 Force Commander. 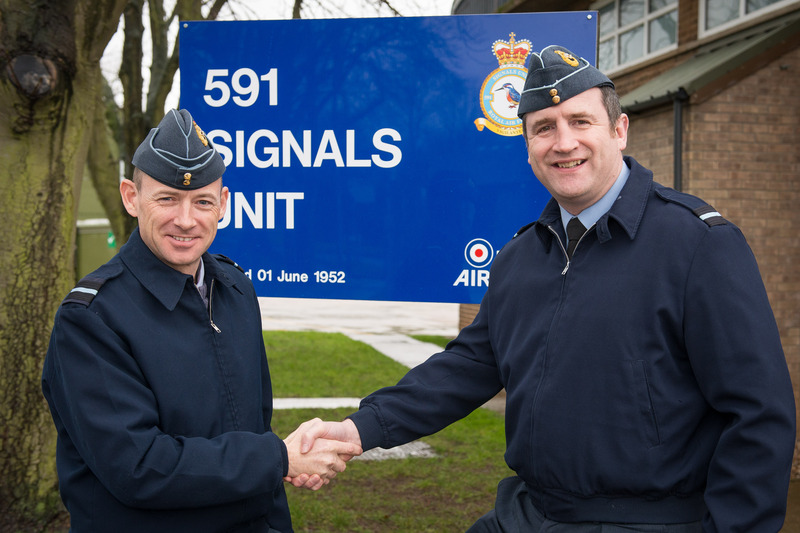 Air Commodore Alastair Seymour and Air Commodore Chris Moore mark the handover of Command to the A6 Force. Air Commodore Chris Moore cuts the Kingfisher cake held by LAC Greg Wass. Left of Air Commodore Moore is Sqn Ldr Jim Doyle. 34 Squadron has been putting its airfield protection skills to the test in preparation for future operational commitments on Exercise Lions Dawn. 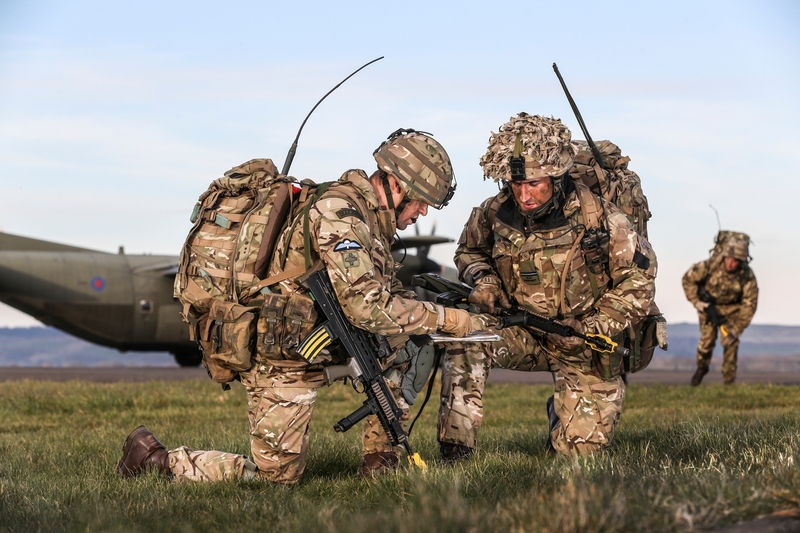 They took part in the intensive five day exercise at West Freugh Airfield, Scotland, to conclude preparations for their new role in the Joint Expeditionary Force where it will take up a position of Very High Readiness from April 2016. During the exercise, the Squadron, who provided airfield protection in Afghanistan, were required to seize and take control of an airfield to allow future aircraft operations to take place safely. The Squadron was transported by a C-130 Hercules aircraft, where upon arrival at the airfield they were faced with a variety of challenging tasks. 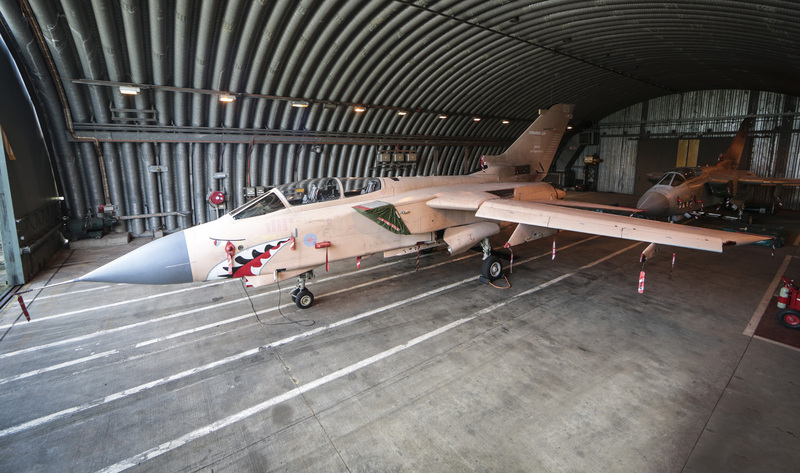 After initially clearing and taking control of the airfield, they had to deal with multiple scenarios including public order incidents, insider threats, an attack against a known enemy stronghold and an enemy assault against the airfield. 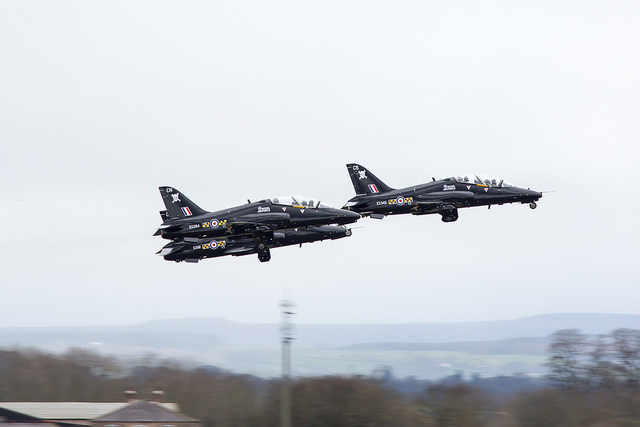 The exercise was supported throughout by Typhoons and Hawks from 100 Squadron. 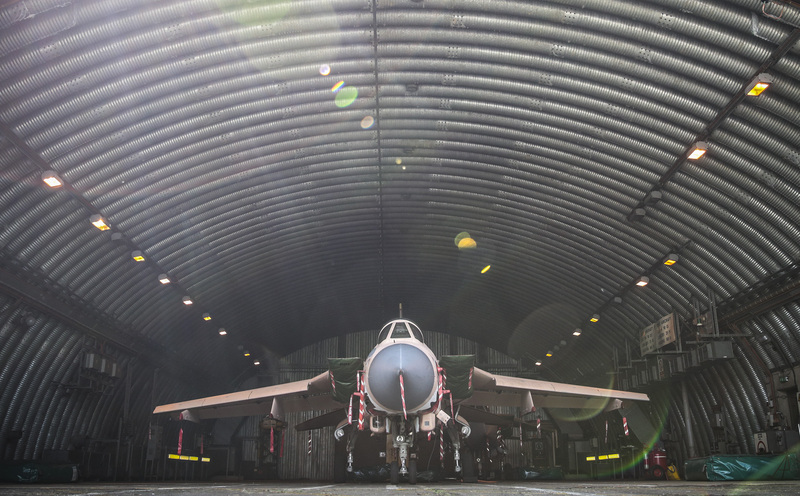 Over the past year, 34 Squadron has been hard at work preparing for a role in the Joint Expeditionary Force. 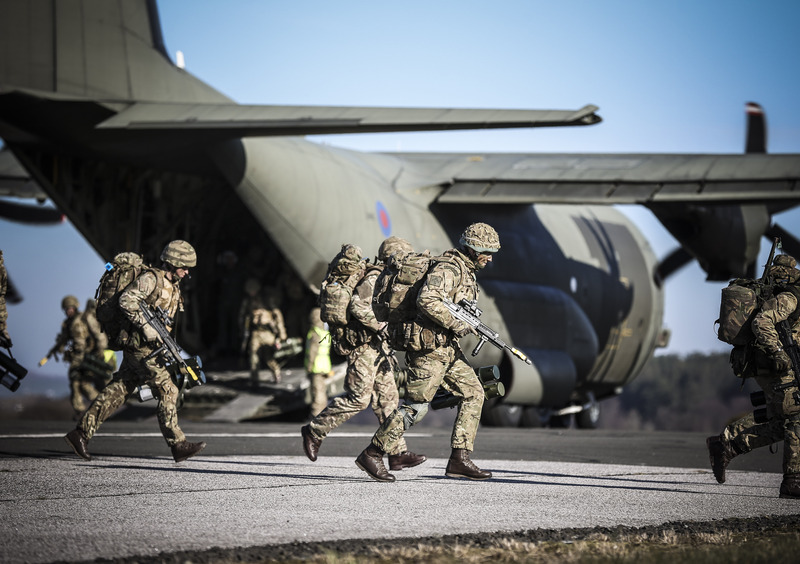 The Joint Expeditionary Force is a pool of high readiness, adaptable forces that is designed to enhance the UK’s ability to respond rapidly, anywhere in the world, with like-minded allies, or on behalf of international organisations such as the UN or NATO. 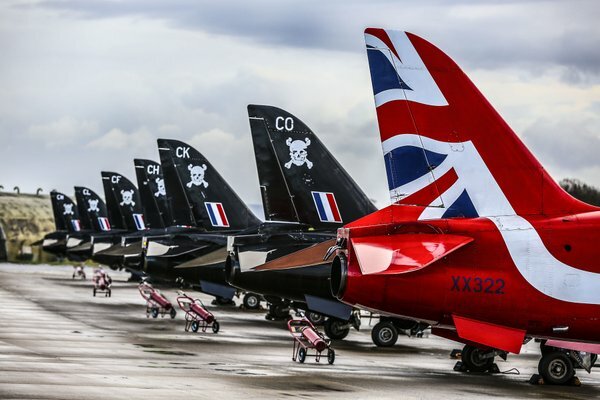 Details posted on Fighter Control indicate that RAF participants include Hawks, Tornado, Typhoon, Shadow, Airseeker and E3D. Operating in the field or staging through Leeming are Chinook, Apache, Gazelle and Puma. US participants include A-10s, and AH6 Little Birds based at Leeming. Operating from Mildenhall will be a JSTARS (13th-15th only), MC-130s and F-15s from Lakenheath. CV22s will operate from Mildenhall but may land away on occasion. Exercise flying days are 13th -15th and 18th - 20th inclusive 10-00 - 16-00 UTC. Three areas will operate simultaneously - Spadeadam, Otterburn and Catterick with assets rotating between each during the exercise. Little Birds should arrive at Leeming in C-17s with the A-10s flying into Leeming Sunday/Monday/Tuesday. 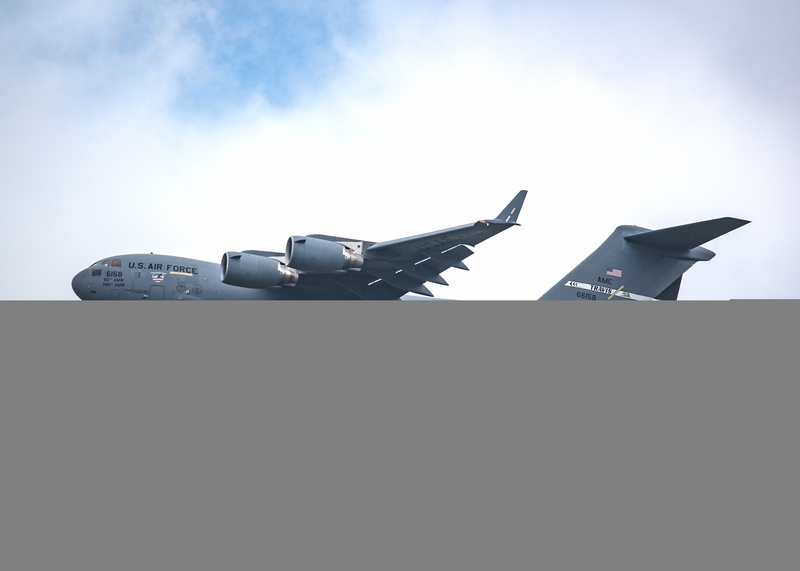 Personnel will arrive in a mixture of C-17s and civil aircraft. As always this is unconfirmed intel and plans can change. 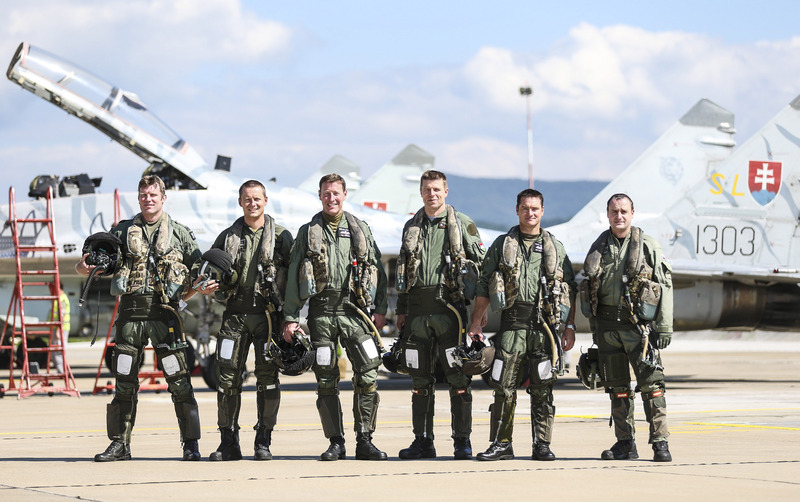 100 Sqn pilots have been training NATO partners in UK air combat techniques as part of a two week exercise in Slovakia. 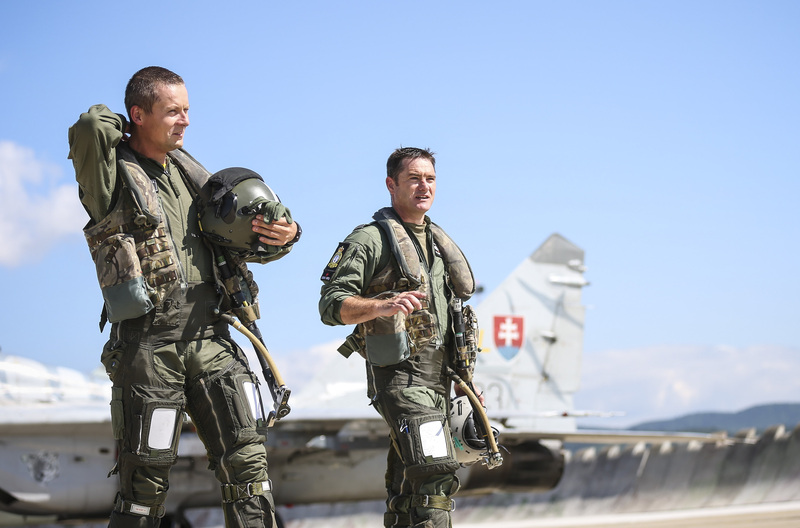 The exercise, SLOVAK HAWK III, involved air combat instructors from the squadron providing training to an experienced instructor pilot from the Slovak Air Force. Operating out of Sliač Air Base, central Slovakia, instructors conducted air combat training scenarios using three Hawk TMK1 aircraft of 100 Squadron, which usually provide support as simulated adversaries for the Typhoon Squadrons and Joint Helicopter Command in the UK. The scenarios involved two pilots fighting against a single enemy pilot using UK tactics and techniques. 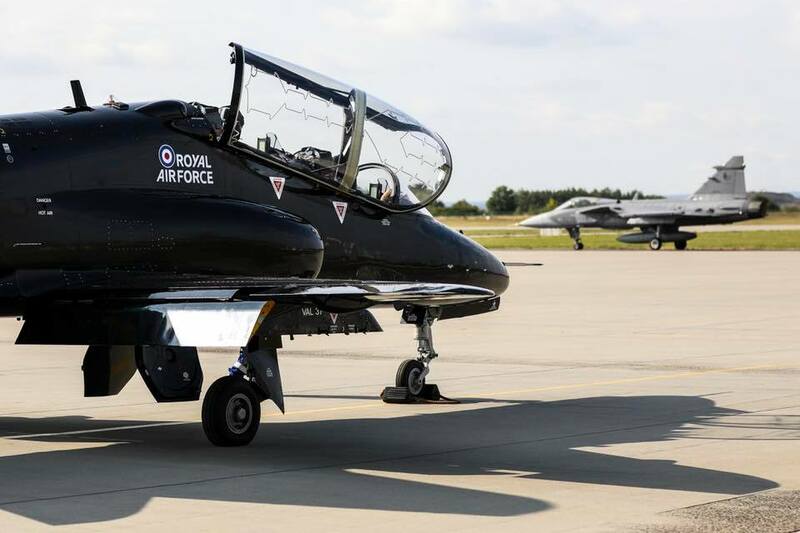 RAF pilots were in all three Hawk aircraft and the Slovakian pilot, Maj Ján ‘Conan’ Kurtík, was primarily instructed from the number two aircraft position by a 100 Squadron air combat instructor. He was eventually given exposure in all three fighting positions, again with an air combat instructor. It is the third time the exercise has taken place since 2007 and builds on training from previous years. MIG-29 pilot, Maj Kurtík, was taking part in the exercise for the second time. 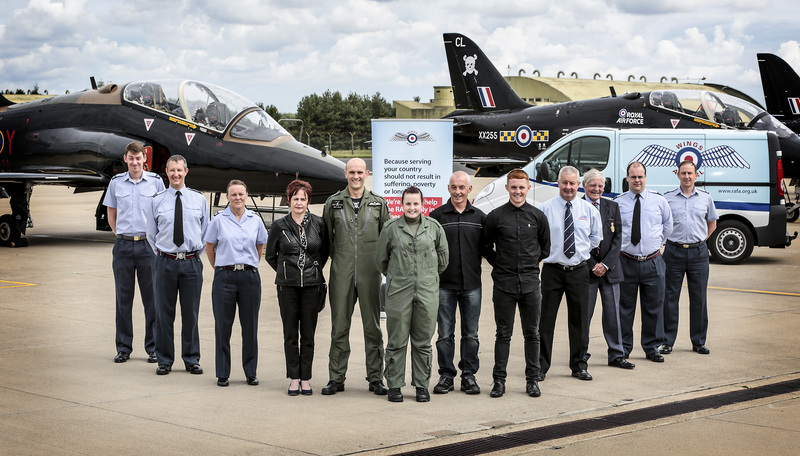 He said: “Our friends from 100 Squadron came here to teach us about air combat manoeuvres. We started last year with one on one and this is the next level with two against one air combat training. On the final day of Ex Slovak Hawk, one of the hawk jet pilots had the opportunity to carry out a one on one air combat scenario against the MIG-29 flown by Maj Jan Kurtik. Wing Commander Andy Wright, Officer Commanding 100 Squadron said: “The idea of the exercise is that we train the trainers. We teach their top level instructors, who will hopefully then take on their experiences here and develop their own air combat training. One of the three Hawks remained in Slovakia as a static display at the Slovak International Air Fest 2016. 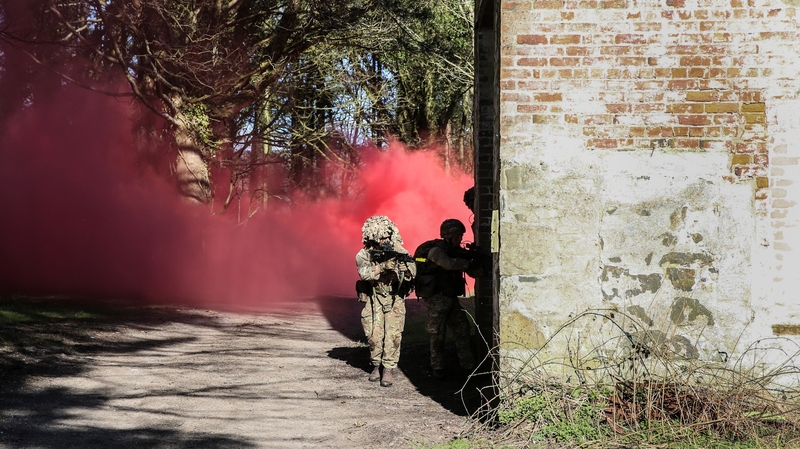 An area of RAF Leeming was transformed into a remote Detached Operating Base (DOB) of 135 EAW, as they trained under the expert tutoring of Leeming's Operational Training Centre (OTC). 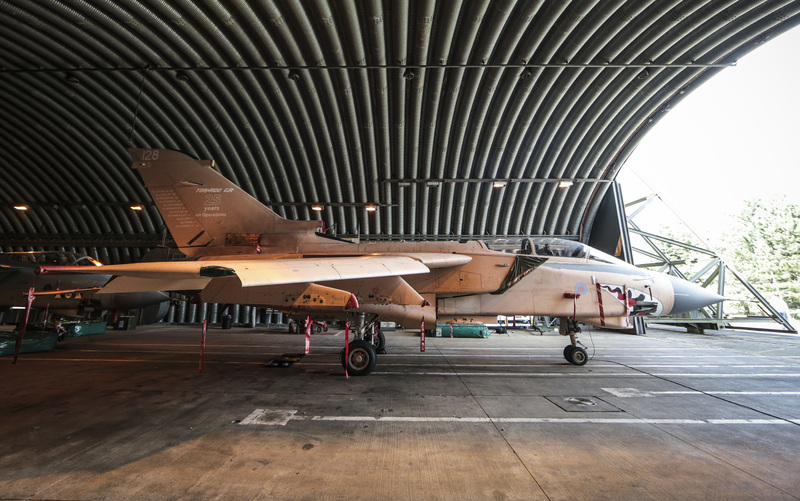 The Exercise aims to enhance learning through the establishment of a simulated DOB supporting the UK Air Component in the projection of airpower and informs Air Command of EAW readiness for contingency operations. OTC Chief of Staff, Squadron Leader Charlie Lynn said "Exercise Agile Eagle is a fantastic opportunity for EAW personnel to train in preparation for potential deployment on expeditionary air operations, anywhere in the world. 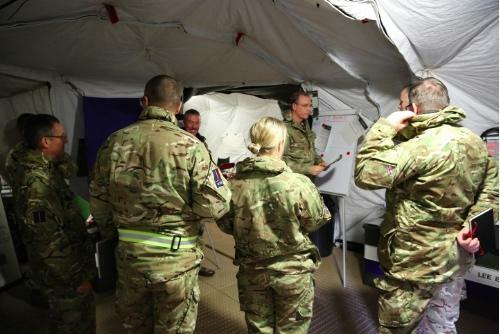 The Exercise superbly demonstrates the 'Whole Force' concept, with both Regular and Reserves working closely together to deliver a complex exercise scenario". 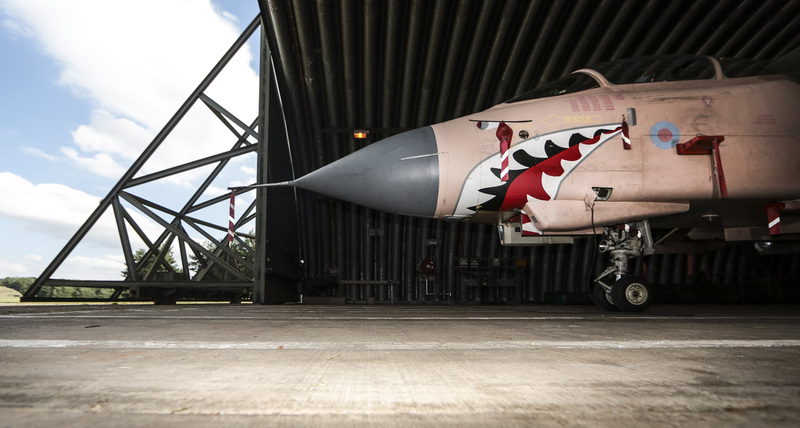 135 EAW Headquarters is supported by a range of Air Combat Support and Air Combat Service Support Units. The Regular and Reserve subject matter experts are drawn from across the RAF and provide mentoring and guidance through-out the exercise. Wing Commander Stu Clarke, CO 135 EAW said "The Exercise has afforded 135 EAW a fabulous opportunity to learn, test and evaluate its' operational procedures against a very realistic and complex scenario. 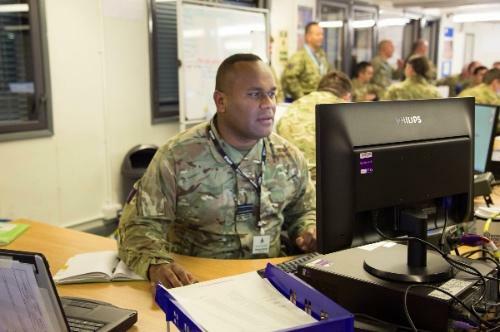 After facing many training challenges delivered from the very experienced Exercise Control staff, I now know that 135 EAW is better prepared to deploy worldwide to meet any contingent operations". 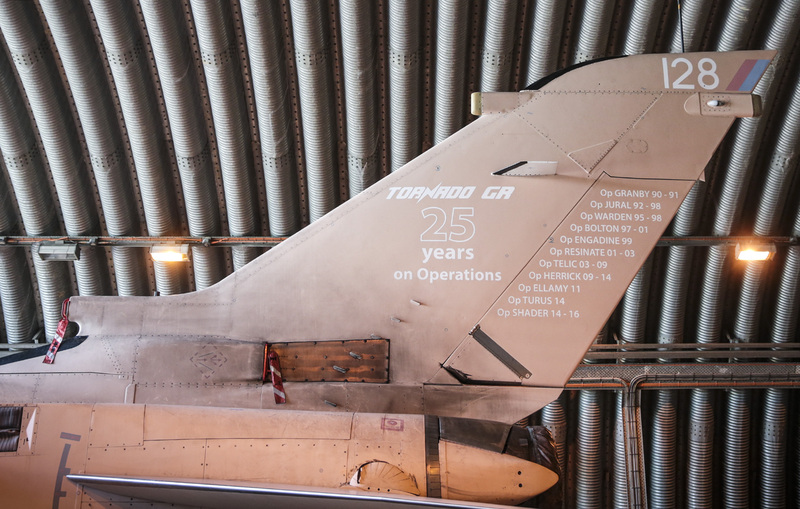 Wing Commander Chris Thorpe, OTC SO1 said "We aim to provide participating Expeditionary Air Wings with a realistic, dynamic and challenging scenario, within which they develop and display their ability. It is rewarding to see an EAW grow in confidence during their time on Exercise Agile Eagle". The afternoon event featured an airfield attack demo and a static display of home and visiting aircraft, images of which can be seen on Colin Fawcett's Flickr site (Info Zone weblink). 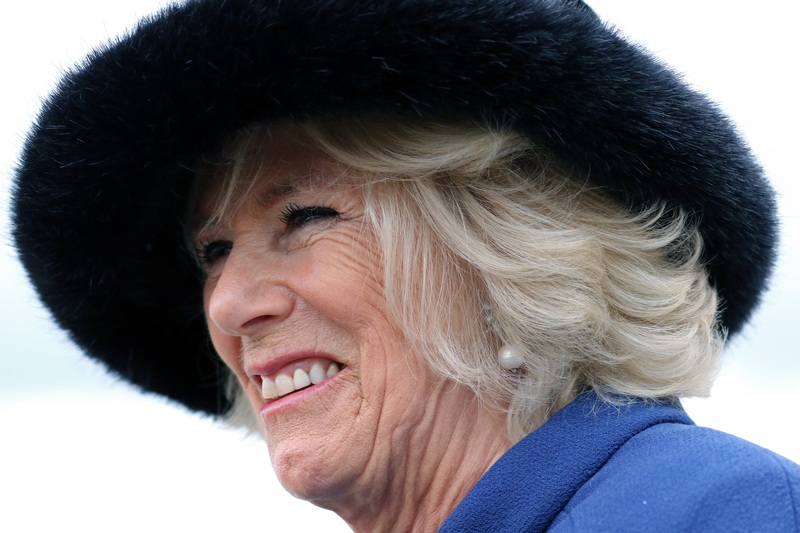 The 100 Squadron colour was paraded and the salute taken by the Stn Cdr in the presence of HRH The Duchess of Cornwall who is an Honorary Commodore to RAF Leeming. Photos are by Leeming Aviation, Colin Fawcett and Peter Forbes.